"The Horse Thief" is the 80th Mandrake Sunday story. The story was written by Lee Falk and drawn by Phil Davis. In the city there are a series of robberies. By a masked, armed and talking horse. Mr Jones, the president of the First Bank. 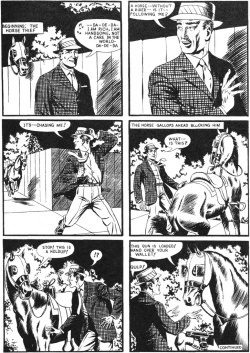 The story title is taken from the strip of August 30 and September 6, 1959 (Next Week: "The Horse Thief" & Beginning: The Horse Thief). This page was last edited on 5 January 2019, at 10:40.